Easy to use key tags to identify real estate for estate agents. 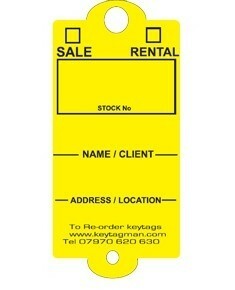 Real Estate & Estate Agent Key Tags are designed specifically for letting and estate agents. Easy plastic tags are great for identifying and labeling keys. Supplied in boxes of 200, complete with 2 FREE marker pens and split rings.